$12,000 of APF Plus, Auburn Laboratories, Inc. veterinary herbal supplement, donated to veterinarians providing aid to horses affected by the devastating fires. The fires that swept through thousands of acres of Southern California last month displaced hundreds of horses. Evacuations of horses in emergency situations often result in separation from their owners, and frequently relocation to unfamiliar and often crowded environments. 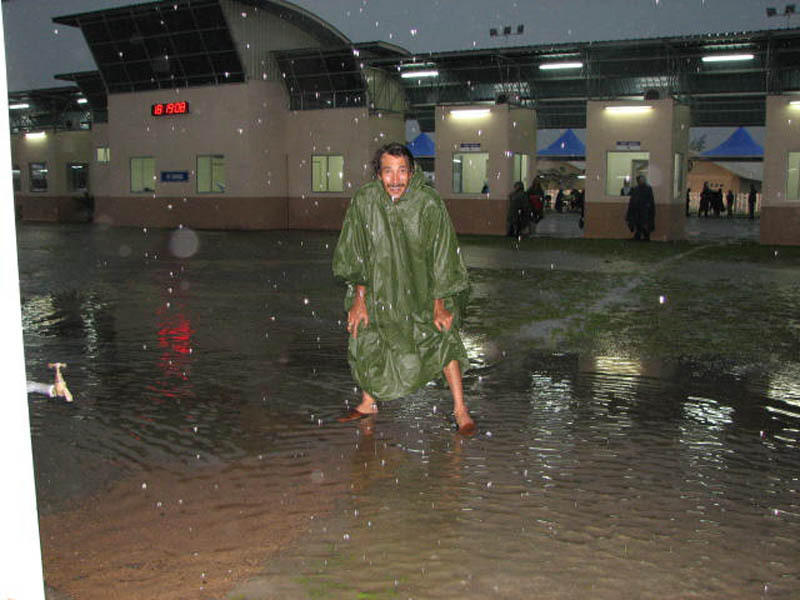 Local veterinarians were active in coordination the evacuation and rescue effects. They were responsible for setting up information clearing centers, arranging stabling for horses being quickly evacuated, and tending to horses in need of medical attention, often in the absence of owners who had been separated from their horses. Like the companys original formula, APF, APF Plus is a proven immuno-modulator. APF Plus helps protect and maintain proper immune response and cellular metabolism in horses experiencing significant stress. For more information, please visit their website, www.auburnlabs.com. On November 1, 2007, Senator Mike Crapo (R-ID) introduced the Preserving our Equine Heritage on Public Lands Act (S. 2238). Senator Crapo introduced similar legislation in the last Congress. This bill recognizes the importance of saddle and pack stock in the settling, exploration and recreation of our country by ensuring that the horse’s historic and traditional use is recognized as our public lands are managed by the National Park Service, the Bureau of Land Management, the United States Fish and Wildlife Service, and the Forest Service. The bill directs the Secretaries of Interior and Agriculture to manage the federal lands under their jurisdiction “in a manner that preserves and facilitates the continued use and access of pack and saddle stock animals” on lands on which “there is a historical tradition” of use. The bill applies to the management of the National Park System, BLM lands, National Wildlife Refuge System land, and National Forest System land. The bill provides that such lands “shall remain open and accessible to the use of pack and saddle stock animals” where there is a tradition of use, but does not limit the federal agencies’ ultimate authority to restrict such use, provided the agencies perform the review required under the National Environmental Policy Act of 1969. The bill would also impose additional specific and designated procedures to be followed by agencies before any land closures to horses. These procedures include advance notice of any proposed reduction in use to allow public comment, convening a public meeting near the area involved, and collaboration with various users during the process. The bill directs the Secretaries of the Interior and Agriculture to issue a policy within 180 days of enactment that defines the meaning of “historical tradition of the use of pack and saddle stock animals” on federal lands. The bill was referred to the Senate Committee on Energy and Natural Resources. WASHINGTON, DC– November 7, 2007 –Senator Mike Crapo (R-ID) introduced the Preserving our Equine Heritage on Public Lands Act (S. 2283) on November 1st. This bill is similar to the so-called “Right-to-Ride” bill that was introduced in the last Congress by Senator Crapo. The bill directs the Secretaries of Interior and Agriculture to manage the federal lands under their jurisdiction “in a manner that preserves and facilitates the continued use and access of pack and saddle stock animals” on lands on which “there is a historical tradition” of use. The bill provides that such lands “shall remain open and accessible to the use of pack and saddle stock animals” where there is such a tradition. The bill applies to the management of the National Park System, BLM lands, National Wildlife Refuge System land, and National Forest System land. The bill does not limit the federal agencies’ ultimate authority to restrict such use, provided the agencies perform the review required under the National Environmental Policy Act of 1969. The bill would also impose additional specific and designated procedures to be followed by agencies before any land closures. These procedures include advance notice of any proposed reduction in use to allow public comment, convening a public meeting near the area involved, and collaboration with various users during the process. Those who enjoy riding on public lands have been concerned about the reduction of trails and public lands available to horses and pack stock. This bill recognizes the importance of saddle and pack stock in the settling, exploration and recreation of our country by ensuring that the horse’s historic and traditional use is recognized as our public lands are managed by the National Park Service, the Bureau of Land Management, the United States Fish and Wildlife Service, and the Forest Service. Lexington, KY – The United States Equestrian Federation (USEF) and the National Affiliate Working Group (NAWG) committee is pleased to announce that Kirsten Kimbler is the winner of the 2007 Youth Sportsman’s Award. Selected from an outstanding group of young adults, Kimbler, of Aberdeen, SD, has demonstrated an ongoing commitment and dedication to the USEF and her affiliate organizations and has served as a role model for her peers. Kimbler will receive a trophy, a $1,000 scholarship to the educational program of her choice and a lifetime membership to USEF, valued at $2,500. The trophy will be presented to Kimbler at the USEF Annual Meeting in January, 2008. “While all the candidates for this award had amazing contributions to the equine industry and truly set the bar high for the future, Kirsten was extra special because she is actively involved with equestrian sports on both a national level with the Arabian Horse Association and internationally with her FEI endurance riding competitions,” said Karen Homer-Brown, USEF’s Managing Director of National Affiliates. “In addition, with her passion for the horse industry, Kirsten truly lives up to the USEF motto, One with the Horse,” said Homer-Brown. The USEF Youth Sportsman’s Award is designed to develop youths to become leaders in the equine industry from all breeds and disciplines. This program provides an opportunity for the USEF to recognize outstanding youth members for their achievements. The award is named after the Sportsman’s Charter, which is the motto of the USEF. The first winner was Caitlyn Novotny from the American Morgan Horse Association. Novotny received her award in January 2007 at the Pegasus Awards Banquet at the USEF Annual Meeting. For more information on the USEF Youth Sportsman’s Award, please contact Karen Homer-Brown, Managing Director of National Affiliates, via e-mail at khbrown@usef.org or call (859) 225-6958. 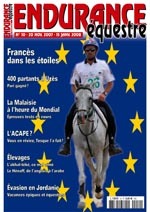 Jean Phillipe Frances of France, Gold medalist at the 2007 Endurance Championship in Portugal, is on the November-December cover of the French endurance magazine, Endurance Equestre. Frances, riding Hanaba du Bois on September 8, 2007, finished second in the Open Qatar Challenge and captured the indivual Gold in the European Championship. Merri Melde, roving photojournalist for Endurance.net and EnduranceEurope.net, took the photo. Cosby, MO. November 15, 2007 –It takes a strong and committed equestrian to complete the notorious Tevis Cup—the California-based, one day, 100-mile endurance ride with a reputation for only half the horse and rider entrants finishing. Prime Performance Nutrition is proud to announce that Tevis Cup finisher David Putnam (of California) uses the company’s supplements to keep his horses in top shape for big-time trail and endurance rides. Putnam says ProbioForm and Prime Defense help his horses’ immune systems, keeping them healthy as they prepare for the big rides. Putnam made his great ride on WH Simon Phoenix, but also prepares other horses, just in case his favorite mount isn’t healthy enough for competition. Putnam’s horse, WH Simon Phoenix also completed the 160 kilometer Florac race in France—also with the help of PPN. Putnam says the usually lazy horse was energetic and ready to run—even at the end of the races. PPN products provide horses with nutrition to help them perform on the race track, polo field, jumping course, reining arena, or show pen. With continuing research, you’ll know your horses are getting what’s recommended and what the container lists. As a long-time industry insider, Butler founded PPN to provide other horse owners with quality supplements and guaranteed content. He knew equestrians around the world were looking for high-quality, effective products. In addition to guaranteeing ingredients and testing, PPN is committed to working with international government agencies and organizations such as the National Animal Supplement Council (NASC) to follow new supplement regulations. PPN products carry the NASC seal. Log on to http://www.primeperformancenutrition.com for a chance to win a year’s supply of your horse’s supplements. For more information about Prime Performance Nutrition, please visit http://www.primeperformancenutrition.com or call (888) 457-4235. When I was about 7 years old, I was taking lessons and learning how to ride horses from a wonderful lady by the name of Terryl Reed in the Auburn, California area. Terryl told me about this 100-mile trail ride, that both she and her brother had completed, where you got to ride all day and all night through the Sierra Nevada Mountains. And you got a belt buckle just for finishing the ride. I remember being awestruck and totally inspired, thinking about HOW COOL that would be! This year, was truly just MAGICAL. Fate was on my side from the very beginning. At the AERC Convention in February, I had purchased a bunch of raffle tickets and had put about half of them into the National Awards drawing, hoping fervently to win the single Tevis Entry that the Western States Trail Foundation had generously donated. My mom and I had gone out to lunch, and at lunch I had stated how much I hoped to win the entry, my mom stated how much she hoped NOT to have won the entry, since it is non-transferable and she didn’t feel up to riding that trail yet. Words cannot express my utter shock, amazement, and pure joy that I felt when we came back from lunch and went by the raffle booth to find MY NAME as the winner of the Tevis Entry! I was totally speechless, just making some strange noises and pointing, until much squealing ensued. I had a huge smile on my face and was walking on clouds for the rest of the day, heck, the rest of the MONTH. The week before the ride was pure chaos it seemed with finals at school (Summer Semester) and month-end close at work and I ended up scrambling around and trying to get the last of the stuff together on Friday morning, feeling way too stressed about all this packing and ready to just throw the horse in the trailer and say to hell with the rest of it. I ended up leaving Reno about noon, about two hours later than I had wanted to but at least we were on our way. My mom, sister, and husband would be crewing for me and Lucy would also be on hand to lend assistance when necessary and help to drive the small flotilla of rigs that I ended up with (don’t ask). Finally arrived and got settled in up at Robie Park. Went to the new rider briefing, nothing unexpected, they talked about pacing and the change on the Michigan Bluff stop to a new vet check down the road, but it was nice to just have my thoughts reinforced and to know that there were no changes or surprises to the game plan I had in place. Got Sinatra vetted in, we were number 181 (which my mom pointed out, 1+8+1 = 10 = 1+0 = 1 = first buckle). Kim Orr and Luke recently took first place in The Hallelujah Benefit Race, a 100-mile event in Rhode Island. NEW WINDSOR -- Chewing his hay, carefully eyeing passersby, and neighing to make sure he's heard, Luke is king of his stable. Luke is a champion endurance racer -- he's won all four of the 100 mile races his owner, Kim Orr, has entered him in. But Luke hasn't always had the pleasures of food, shelter and tender loving care. He was starved and neglected by his previous owners and survived only thanks to Days End Farm Horse Rescue. In April 1999, Luke's weight was at a dangerously low 700 pounds and he was rather small for a Crabbet and Russian-mixed Arabian at 14.1 hands. Over the next five to six months, he gained 280 pounds and grew another hand, or 4 more inches, going from pony-sized to a full-grown horse. What was unusual, Orr pointed out, is that most horses reach their tallest at about 2 years old. Luke was 6 years old and should have been at full height. Now, Luke is a known champion. A few weeks ago he ran a 100-mile race, The Hallelujah Benefit Race, in Rhode Island, and took first place, said Troy Smith, spokesperson for American Endurance Ride Conference, the official U.S. organization for endurance riding. "There is something about the way they move and the way they look," Orr said. "With Luke, I didn't know his genetics, but I knew there was something about him ... He came from hard luck, he's going to give you all he's got." Orr has noticed that when other people ride him, Luke doesn't perform well. But when she rides him, he gives her 110 percent. Laughingly she said some on the farm call him a "momma's boy." Orr believes the bond she and Luke share is the reason he competes well in races -- he knows Orr loves him and feels completely safe with her. At her A.O.K. Farm, Orr implements a well thought-out training plan for her 13 horses, four of which are race ready. Going against the grain, she takes training a little bit easier, focusing on not just the distance, but also intervals, the type of ground they are running on and their gear. She has the best saddles, shoes and trainers. It's not just the horses that go through training. The riders do also. To keep herself in shape, Orr runs 20 miles a week, lifts weights, practices yoga and does pilates, in addition to the work that she does on the farm and the 10-hour days she puts in as a hairstylist. She wasn't always so fit or ready to ride. A year ago, she was riding another horse, Chase, on her farm, just after he was broken. He bucked, she jumped off and broke her hip. The doctors said she had a 5 percent chance of being able to keep her own hip. Orr was told that she wouldn't be able to ride for a year and that she'd have to learn how to walk again. Six months after the accident, she was riding again. "Why was I able to ride in six months? Because a lot of people were praying for me," she said. I kid you not, Azrin and Zulu were on the trail, loop 3, driving it ahead of the riders when, much to their surprise, they noticed fish swimming on the trail! It is likely one of the only endurance venues in the WORLD where you will find our aqual neighbors on the trail! and yes, they were so surprised they stopped and checked it out. pictures on the evening news. In the meantime, you'll have to do with "Boy in the Rain"
The Lake Oroville Vista Endurance (LOVE) group held the 9th annual endurance ride on Saturday with its largest field ever. Laurie Anderson said that the turnout exceeded their estimation with nearly 200 entries showing up to take part in this ride. The riders came from all over the western United States she said and were arriving late into the night on Friday until both levels of the parking lot were triple parked and overflowing. "It was an amazing ride. I think we really surprised everyone with how many people showed up," Anderson said. "It took a lot of work to get everything started especially in the dark." Anderson said that the help of the Department of Water Resources was really key in making sure everything went off without a hitch. "They (DWR) did a lot of work to make sure it went well. They had patrols monitoring the area the whole weekend on their own time," she said. The ride trotted out at 7 a.m. for the 50-mile ride and those going only 30 miles started out at 8 a.m. from the Diversion Pool. The event was coordinated by State Parks Mounted Assistance Unit and Kathy Papa was the ride manager. Anderson said that despite the overwhelming numbers the responses from both the volunteers and the riderswere positive. "The riders (from out of town) couldn't believe the trails. They just loved them," Anderson said. "And no matter what was going on the volunteers always had a smile on their face." The ride featured a who's who in endurance riding with a number of seasoned riders, champions and Tevis Cup winners. The course began at the Diversion Pool and went up through the Loafer Creek area. It went across Highway 162 into Stringtown area. And all along the trail, volunteers were stationed in order to help the riders and to keep them on the proper trail. "It was actually unseasonably hot this year," Anderson said. "So it took a lot of hard work from our volunteers to help keep the horses cool." Anderson said there were 100's of volunteers doing everything from manning the trails to taking pulses at the check points and serving food at the halfway point. "A lot of the volunteers don't ride or even have anything to do with horses," she said. A buffet was laid out at the halfway point and was donated by Dr. Shannon serving sandwiches and at the end of the ride, a barbecue dinner was set up. Anderson said that the ride was also given the assistance of the Sweep Rider of the Sierras (SOS), the only mounted assistance rescue unit in the west. SOS doesn't just ride with every event. Anderson said the LOVE ride was very lucky to get them involved. The SOS riders are ham radio operators and are trained for emergency situations. "They "sweep" along behind the riders checking the trails and are there to render assistance if needed," Anderson said. "They are a critical link for the Tevis Cup 100-mile ride." Anderson said she wanted to stress how important the volunteers and DWR were to making the LOVE ride a success. "We had a blast with the event. Even the riders coming in at 7 p.m. at the cutoff had huge smiles on their faces," Anderson said. The motto to finish is to win was definitely seen in the riders. She said that there were awards, donated from throughout the community, given to a variety of categories from the best conditioned to fun awards for oldest and youngest riders along with a tail end award for the final finisher. Anderson said she wanted to thank DWR, the veterinarians and all the volunteers that made the ride possible. With a special thanks to Dr. Richard Smith who marked the trails. "That's always a lot of work making sure the markings are easy to see in order to keep people on the right path," Anderson said. The 50-mile top finishers were Kristine Hartman of Meadow Vista on 9-year-old Sam and Dennis Tracy on San Ffrancisco in five hours 34 minutes. 30-mile top finisher was Charlotte Fairbanks in four hours and one minute. Best conditioned for the 50 miles was Suzanne Huff of Gardenerville, NV on Chase the Wind, her 17-year-old Arabian. fairly long walk from the arrival timer. Josie said "lots of tripping"
a labor of love on his part. Did better on the 50's, started writing as they called them out. horse they were starting, etc. This is how I HEARD it so sorry if I got names wrong. hopefully they were able to find it. I just want to take a minute of your time and publicly say "Thank You" to all of those out there that called, emailed, and sent us donations for hay. It's wonderful to know that people like you folks are out there for support in time of need. We really did need support, but things are looking better 12 days after the fires. We are now doing demo & cleaning up of our Master bedroom, my Dads house, my Son's travel trailer, the 18 stall barn, the equipment and tractor shop (including tractors & tools), TR Products, Carol Resner's Car, the two big water tanks & trailers we use for the Git-R-Done rides. It has taken, as of today 8, 40 foot dump trailers to haul this stuff out and we're still not done! We had a nice Mexican Family haul off most of the metal to salvage yards (I hope they make some $ for there family) for recycle. 4 of our horses are back, The Twins, Sharkee, & Big Enough. Felina our goat (we got from Kim Fuess) is doing good. She's a little out of place without the barn but she either thinks she's a Dog or a Horse pending on the time of day & settles in. 4 more of my horses will not be able to return back here for a month or so. Carol's 3 horses are at Charlene's Ranch and will have to return when things get built back. Some of you have called or emailed me and asked about "Money" my pet Peachick. He's doing fine and is with 3 ducklings and my Son's full grown duck "Clyde." All of these animals were also taken care of by my daughter "Charlene Lewis." She had my 5 Dogs for a few days too. Dogs, Cats & Birds are now back home. The 2 cats were in Carol's living quarters so they were returned back a few days after the fires along with the dogs. 5 Barn Cats were alive. 3 we saw right away, 1 we saw a few days later and we just had a sighting of 1 on Sunday. All seem in good shape...unbelievable! Food and water have been set out so I can see the cats at least once in a while. (Most of you don't know, but I've always rescued adult cats that can't be placed in homes after their allotted time. Most are very wild and can't be touched for a while or with some, never.) I never have rodent problems and the Cats have a chance for a life. The trees that have been burned, some of the older ones will make it, but some were only 5 years old might not. It's sad to see. I hiked along the outside of our place, which is the area we used to put on the Hog Wild rides on, and it all looks like the moon. Some trees made it along the wash but the rest in the canyon areas are all black. All of that old wood in the Hog Ranch is gone, so all that is standing out there is concrete stuff. The wildlife is all but gone. I saw one Coyote (alive) and 3 dead ones. A lot of small animals were burned, small bones everywhere, some a few days after the fire were half burned and we had to finish the suffering. My husband "Charlie" seem to get that job, I just couldn't.... Anyway, on a happier note. The Birds are returning, I have set out lots of wild bird feed and hummingbird food with good results. I haven't seen any deer, foxes or bobcats yet, but I have a water tank and a few buckets of lower water for them just in case. THANK YOU SO MUCH FOR ALL OF YOUR THOUGHTS AND SUPPORT!!!!! You are invited… To participate in the 2008 Canadian Rocky Mountain Challenge! Come enjoy down home Alberta hospitality in the scenic foothills of the Rocky Mountains July 30 – Aug 4, 2008! We are very excited to announce that Alberta has been selected by CaLDRA and Endurance Canada to host the 2008 Competitive Trail, Endurance and Ride N’ Tie Canadian National Championships. This multi-day equine event will be held at the beautiful Red Deer River Ranches, near Sundre, Alberta. The ranch boasts 1,000 acres of private land that is directly connected to over 50,000 acres of grazing lease. The majority of the land is open forest/range-land. There are numerous creeks to cross and ride along. Trails consist of open terrain, heavily wooded areas, logging routes and wildlife paths in the foothills of the Canadian Rockies. This area is also known for its population of wild horses. Truly a ‘wild west’ location! In addition to the National competitions, gorgeous scenery, ample camping space, catering, and souvenirs, many other family friendly activities will be made available. Amenities such as grocery, gas, restaurants, tourist attractions, hospital, etc. are located nearby in the town of Sundre. The community is warmly opening their arms to our Nationals visitors and welcomes you! – Open Division 80 miles over 2 days. Day one is pending as an AHA 40 mile ride. – 50 mile FEI 2* including Junior and Young Riders. Pending as AHA ride. Special Feature Competition – a relay race still in the works though will resemble the Pony Express. We also look forward to welcoming individuals who will be able to offer their time and expertise in volunteering for this event. There will be Opening and Closing Ceremonies including a Dinner and Awards Banquet – guaranteed to be very memorable. We promise an entertaining and exhilarating week of celebration. Keep your eyes open for the launch of the Canadian Rocky Mountain Challenge Website www.canadiannationals.org, which will keep you informed of schedule of events, attractions, accommodations, etc. closer to the date of the Nationals. In the meantime, feel free to contact Sandra Nielsen (Phone: 403-637-0245 or Email: sandra.nielsen@xplornet.com) with any questions. Thank you and see you next summer! All horses ridden by Senior riders at CEI 3* rides in this country must have an FEI passport next year (2008). We will not be allowed to accept National Passports for 3* events. I am discussing with the FEI whether Young Riders will be required to ride FEI passported horses at 3* events. I will pass that information on to you. Horses entered in 1* and 2* events do not need a passport. Several wildfires are burning out of control in southern California, driven by Santa Anna winds with sustained wind speeds of 20-30 mph, and gusts up to 60mph. Organizers of the October 27 Inyokern, CA Endurance ride Tammy and Charlie Robinson were forced to evacuate their home outside of Saugus as the fires overtook their property. They are currently staying at the home of their daughter Charlene Lewis of Leona Valley Riding Center. "We have some bad news! We are canceling Git-R-Done ride due to some extremely unfortunate events, as today my parents home has burnt, Tammy and Charlie Robinson. We were barely able to get all 11 horses out, 5 dogs, 1 goat, and 2 cats. All the chickens and birds and 4 other cats did not make it. We just didn’t have enough time! As we were pulling out the driveway the trees and shop was on fire that’s adjacent to the home. Not a single fire truck in site, it was the most hopeless feeling! As most of you know this was a family built home and a lot of heart and soul went into it. Many of you have been there at the X-mas party. This is a huge loss and extremely sad for my family. We will not be putting on the Git-R-Done ride so please contact your friends and spread the word. My family is here at my ranch now. If you really have to contact me for any questions. All checks will be cancelled if they are not burnt already." California fire officials caution residents that the winds are predicted to continue for at least another day and to have an evacuation plan in place if need be. 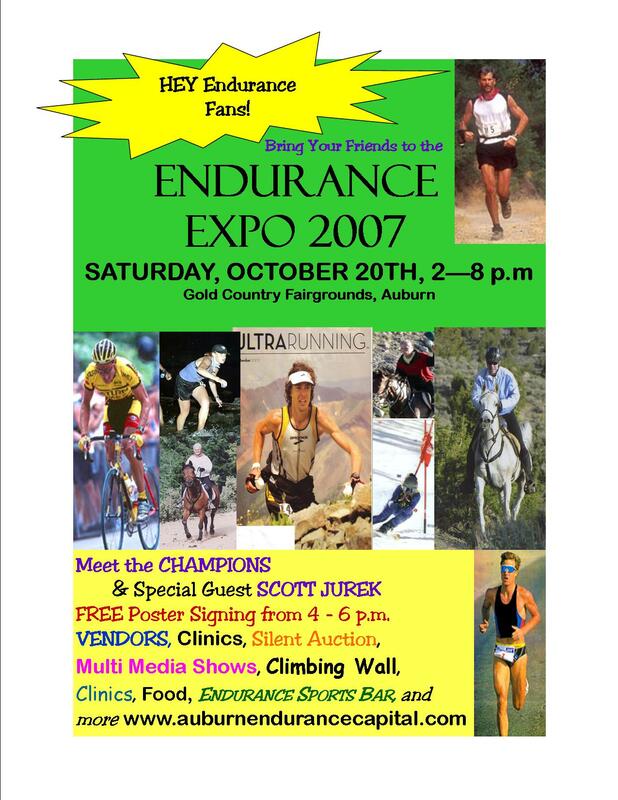 Auburn's Endurance Expo won't just be a big party on the street this year. Organizers of the expo, set for Saturday at the Gold Country Fairgrounds, have implemented a few changes this year. "We changed the format," said Bridget Powers, chairwoman of the Auburn Endurance Capital Committee. "Last year, the event was more of a celebratory street party. This year will be more like an actual expo, where you have clinics, speakers and vendors." The free expo is open to the public and will celebrate this year's main endurance events such as the Western States 100-Mile Endurance Run, Tevis Cup 100-Mile One Day Ride, Auburn International Triathlon and the Cool Mountain Bike Race, as well as many top endurance athletes in the area. More than 40 vendors featuring biking, running, horseback riding and paddling gear will set up in the Armory Building of the Gold Country Fairgrounds. The expo will also feature a multimedia show with photos and videos of this past year's main endurance events, food booths, an endurance sports bar with beer, wine and TVs, a silent auction and a raffle. Free color posters will be available at the expo along with a signing table featuring many local endurance champions including Tim Twietmeyer, Hal Hall, Gordon Ainsleigh, Trent Klasna, Potato Richardson, Brad Kearns, Kathie Perry and Jimmie Brown. Experts and professionals from the fields of running, biking, riding and rafting will be on hand to answer questions and offer clinics at the expo. Endurance games for kids, a climbing wall, raffle, silent auction, music and food can also be found at the expo. "It's a lot of fun getting to see all the new stuff involving bikes, running, riding and rafting," said Lisa Kodl, owner of Auburn Bike Works and vendor at the expo. "Looking at all the footage from past endurance events is also fun. It's chance to see things you usually aren't able to because they happen in the middle of the endurance trail." Kodl will have a booth at the expo and will be sponsoring valet bike parking. "Anyone who want to ride their bike to the event will have a place to park it and someone to watch over it," Kodl said. Powers said the expo will also provide a chance for residents to find out what's available in Auburn. "A lot of people don't realize how much there is to do in Auburn," Powers said. "If you want to find out every possible outdoor activity there is to do in the foothills, everyone will be there that day." The Journal's Jenna Nielsen can be reached at jennan@goldcountrymedia.com or comment on this story at auburnjournal.com. (Left) David Voyles and his daughter, Lindsey, with retired champion Sahara at the start of a water-resistance exercise session. (Right) Sahara and Voyles, along with Miracle Farms owners Reg and Virginia Steele. Nestled at the end of a quiet cul-de-sac in eastern Shelby County, in an area abundant with equine-oriented estates and subdivisions, is a small building that houses one of the latest innovations in restoring the health of ill and injured horses. About eight months ago, Miracle Farms owners Reg and Virginia Steele and the facility's manager, David Voyles, installed an AquaPacer Equine Underwater Treadmill and began helping horses recover from injury, regain mobility following surgery, and increase strength and endurance with an equine version of water aerobics. When the Steeles purchased the property just a few years ago, the 16 acres of Miracle Farms was basically raw land with only the shell of a home under construction. Now, the house is finished, the surrounding acreage is beautifully landscaped, there is a first-class outdoor arena with all the accoutrement required for hunter-jumper riding, and a 7-stall barn sits just a few paces away from the hydrotherapy center. The unit is one of only four of its type in U.S., and the closest ones to Memphis are located at the University of Kentucky and the University of Mississippi. The unit is designed to help animals recover more quickly from orthopedic surgeries, soft tissue injuries, provide relief from back and other muscular soreness, and for general conditioning and muscle development. The treadmill operates at speeds up to 7 miles an hour, and treatment or training is achieved through a specific combination of treadmill speed, water depth, and workout time. Using hydrotherapy results in a 50% decrease in healing time and conditioning time, according to Voyles, and often more than that. "The main thing is the speed. All that healing time and conditioning time that you don't have to tie your horse up," he says. "Give me two weeks, and I'll give you a month's worth of impact...It doesn't matter which breed or which discipline they're in, it's effective for all of them." With regard to conditioning, he says that some "...want to leave their horse here for two weeks while they're gone on vacation. We can double the effect." Miracle Farms existed in a previous incarnation as place where city kids could come to learn about nature and get some exposure to farm animals and biology, and when the Steeles relocated they asked themselves "...how do we fit into the equine community, what do we do? The name was already there, and we didn't want to 'compete.' And we said 'That (name) is perfect. We can create new opportunities and miracles for horses that have had bad experiences or just really need something that can take them to the next level. So the name kind of led us...to the hydrotherapy...We call it 'an aquatic retreat for horses.'" An it is a very nice one, but it should be noted that nearly all of the 'clients' are referred by veterinarians or professional trainers. That restorative mission seems perfectly suited to both the Steeles and Voyles. The Steeles are engaged in the medical industry, Voyles received extensive medical training in the military, and all three share a genuine love for horses. In fact, they met as a result of their daughters riding together at Spring Hill Stables, where he was the manager and the Steeles board some of their horses. The stable is a real model facility, featuring a separate room where feed and medications are stored and charted, tack room, an office for David and a completely furnished apartment with full kitchen for use by vets, trainers or owners who have a horse being treated or trained at the farm. Two of the stalls double as a foaling unit, with a sliding door that separates them. "If you're going to create an environment where you're going to recondition horses you've got to start with the basics," Reg Steele said. "It's got to be clean and well-vented, and well organized.," and Voyles keeps the building in a condition that can only be described as "pristine." In addition to the stalls, there are a half-dozen paddocks, some with run-ins, scattered around the property in close proximity to the barn. "We're set up to whatever we need to do to accomodate the horses," says David. "It's a clean, stress-free environment." The facility provides full board during treatment and training. In a building about the size of a double garage sits the 1000-gallon tank, which is linked to an outside, sealed holding tank. The system has a non-chlorinated double filtration system and is temperature controlled "...just like a swimming pool," says Voyles. "It's in a continuous filtering cycle." The animals are meticulously bathed and their hooves cleaned before they enter the unit, to prevent the introduction of dirt and other debris. It takes approximately 15 minutes to completely fill the tank but that's rarely done, unless treatment for a condition calls for the horse to be totally "floated." At very low water levels the unit provides mostly resistance, but as the depth increases the benefits begin to include reduced weight-bearing and impact, along with hydrostatic pressure to reduce swelling. On this day, the lucky recipient of the poolplay is Sahara, a 16-year old retired National Champion from the hunter-jumper arena. He appeared to be completely at ease with being led into the chamber, and didn't display any nervousness during the roughly five-minute workout. The V-shaped tank has hinged doors at both ends, and the treadmill is only inches off the floor with gradual ramps leading in one end and out the other. It is situated so the animals can look out over one of the farm's paddocks through a set of wide double doors, which helps keep them calm as they get used to the swirling water and the hum of a powerful pump. The layout also permits trailers to back up right to the exit from the tank. Virginia says the first couple of times a horse encounters the machinery, they can be a bit wary, as though they're wondering "..what in the heck are you asking me to do?" But they quickly become accustomed to the process and the real performance horses realize they have the opportunity to do what they were born to do, in spite of any injury or health condition. "The ones that really like to work, when they experience this and get into it, they love it," she says. Anyone considering the filtration system might naturally wonder, what about those inconvenient "pool accidents" that happen from time to time, especially given the casual attitude of horse with regard to that sort of thing. Well, it takes at least two to guide a horse through the routine and one of them is the designated "pooper scooper," armed with fine mesh net mounted on a long handle. The general conditioning regimen typically begins with 5-minute sessions the first week, and builds to 10 minutes the second, 15 the third, and by the fourth week the workouts are up to 20 minutes. Voyles says most conditioning programs last four to six weeks. Injury-related therapy can involve routines as short as couple of minutes the first few times. As odd as it may seem, Voyles says the deeper the water gets, the more an animal tends extends its step. "You'd think, as it gets deeper, they would sort of start short-stepping, but the more drag there is, the faster they go and they tend to lengthen their stride." Virginia says the conditioning regimen is not intended to replace trainers who would normally ride those horses, but does serve a very useful purpose in "complement(ing) the existing equine community...we don't want to compete with any existing organization...We're a small, private farm. We can give one-on-one attention to the animals, their owners and the vets, which is really our objective...We want to complement the existing equine community, which is why we went with the treadmill, because there's just not one here...There's a large horse community here that has a need for this, so we're excited about it." She also noted that injured horses who would most benefit from water therapy would previously have been referred to out-of-state veterinarians during the treatment process. That puts them out from under the direct supervision of the "family doctor" who knows them best. Having hydrotherapy available locally lets both owners and vets keep a constant eye in the progress being made. "It really gives a contiuum of care here in Memphis that's been unavailable in the past," says Virginia. "It allows the horse's regular veterinarian to see what is being accomplished, rather than relying on the judgement of someone else, and adjusting the program as needed in the best interest of the animal." That unbroken stream can mean a lot to an owner in terms of fewer medical fees and reduced transportation cost and effort. Animals undergoing therapy or conditioning can actually be hooked up to certain monitoring eequipment while they are in the tank and Virginia noted that the arena, just a few feet away, provides a place for both vets and trainers to do some real-world testing of the results that have been achieved. Since installing the unit, Miracle Farms has invited a number of regional vets to see a demonstration the system and discuss with them the possibilities for its use in the recuperative process. And the system is not just for horses. While they haven't had occasion to use it with canines (and the company makes units designed for them), Virginia said the hydrotherapy unit would work just as well with dogs and other large animals and they would be happy to discuss the possibilities with owners or vets for treating illnesses like hip displasia. "We've got the biggest one, said Voyles, "so you can pretty much encompass anything." Virginia jokes that she and some friends have talked about using the device for an exercise class, and David says that he has actually "tested the waters." "I've been in it, and it's work," he said. It's hard to imagine that anyone involved in sports or fitness wouldn't at least consider giving it a try. Currently, Miracle Farms is only offering services centered around the hydrotherapy unit and some other rehabilitative equipment purchased from the same manufacturer. "We don't do any boarding, or training. At this point it's totally about being a therapeutic center for horses," says Virginia. "But we also have some other equipment...for icing injuries and compressing for fluid accumulation...The equipment is getting much more advanced, and we hope to build off the hydrotherapy and the other services that are therpeutic in nature." Voyles echoes those sentiments by noting that the focus helps keep things personal, which results in better care for the horses they do take in. owner or the trainer or the horse. It really needs to be directed by a professional. We know what we're doing, but we want them to say what their goal for the horse is, and each discipline and each trainer, and each rider has a different need." She does note one case where they took on a horse without an official "referral," but the horse's regular veterinarian was heavily involved. The animal had a problem with overheating along with some serious gastric distress. "They just wanted to change his environment and get him in the water and cool him down every day. It wasn't really about an injury and it wasn't about conditioning." The owner found Miracle Farms through a friend, but the vet was soon part of the process and agreed the treatment might provide a needed alternative. "...and he improved," says Virginia. "He stayed here a month and we swam him and kept the fans on him..it was during that heat wave and he couldn't sweat, so we just cooled him down with the water and controlled his exercise." Toward the end of his session Sahara gets some encouragement to keep "working harder." As the treadmill slows to a halt and the last of the water drains away, he gratefully accepts a few horsey treats and head rubs as reward for his effort before being led back to the barn by David's daughter, Lindsey. He's sporting a bit of perspiration on his brow and there's that trace of muscle quiver that many athletes exhibit following a good workout, and he seems a lot more energized than when he first walked up the low ramp. For more information on hydrotherapy for horses, you can contact Miracle Farms at 901-753-0747 or visit their web site at http://www.MiracleFarms.org. 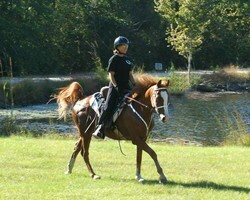 For more information on the Ferno AquaPacer, visit their site at http://www.fernovetsystems.com/equine/aquapacer.htm. Nov. 8 CEI 2* - Lexington, KY - 2008 WEG2010 Pre-Breeze - Arthur W. Priez, Jr.
Below you will find info on the opening of the new Del Dios Highlands Open Space Preserve. This 350 acre preserve is the land that my late husband, Jerry Gradisher and the Escondido Creek Conservancy brokered to ensure it would never be developed. The land is a high ridge between Elfin Forest and Del Dios/Lake Hodges. It abuts the 750 acre Elfin Forest Recreation Reserve to the west and Lake Hodges to the east. This new link has trails that connect Elfin Forest to the Coast to Crest Trail (which travels from Del Mar to Julian). These are excellent horse trail with lots of climbing and magnificent views. Needless to say, the dedication of this land as permanent open space is a dream come true. Sometimes good does win. Thank you Jerry! All your hard work has paid off, I know you will be with us. PS If anyone is interested in doing a training ride, please contact me. on Thursday, October 18 at 11:30 a.m.
Exit Loma Santa Fe Drive. At Del Dios Highway and Date Lane make a left into the preserve staging area. The United States Equestrian Federation (USEF) instituted an Endurance Rider Ranking List beginning this year, 2007. Nominated riders earn points according to placements at FEI 100 mile rides, and a few select non-FEI 100 mile rides (e.g. Tevis). Once a rider nominates with USEF to be ranked, all of their ranked ride points will be recorded. This list will be revolving, with standings being updated over a two year period for every nominated rider on the list. The rider ranking will be used as a determining factor in choosing riders to represent the USA at International events. Rider rankings are based upon the two highest point standing of nominated riders (any horse). The following list represents the list effective October 1, 2007. Virginia City 100 - 40 Years! With a stethoscope around his neck to monitor the heart rate of his Arabian horse Josh, Mike Urschel, 54, of Wabash, Ind., relaxes with his companion Bev Staats following a seven-hour horseback ride to Burlingame. He is a rider in the Great Santa Fe Trail Horse Race. BURLINGAME — Trotting along the Santa Fe Trail on his purebred Arabian, Mike Urschel doesn't tremble, he doesn't shake and — if you can believe it — he feels better than when he is out of the stirrups. Only when he is on solid ground again do you notice the slight hunch, the measured tones in his voice that hint at Parkinson's disease. "When I'm riding, I don't feel anything, like every neuron is moving with that horse," he said half an hour after he and his horse, Josh, crossed the finish line first during Thursday's stretch of the 800-mile, 11-day Great Santa Fe Trail Horse Race. The 40 riders began their day at 7:15 a.m. in Council Grove and seven hours, 50 miles and 80,000 steps later, Urschel won the day's ride. "I feel better today than I have all week," he said. So far, he and Josh have placed first, second and third in some of the race stages. The race began Sept. 1 in Santa Fe, N.M. Some days, such as Thursday, participants ride their horses for seven hours. Other days they are in the saddle longer. From his early days in Wabash, Ind., Urschel loved to ride. He said that after his dad left for work each day, he would throw his leg over a horse and ride all day. "You fool," his dad would say. But when the disease's symptoms snuck around the corner of his 50th birthday, Urschel found solace in the saddle. He takes Mirapex. He soaks his feet in solution. The gruff, mustached 54-year-old even does yoga. But nothing works like riding. Urschel's neurologists don't know why. He isn't sure either, but everyone has got an idea. Darolyn Butler should know. She has traveled the world, from Brazil to Portugal to the United Arab Emirates, riding in world championships. "Time on a horse is time standing still," she said. "You don't age when you're up there." Maggie Rankin, of Clovis, N.M., watched Urschel cross the line and commented about Josh, "That's one hell of a horse." To why the symptoms of Urschel's Parkinson's might wane while riding, she offered an old cowboy saying, "The outside of a horse is good for the inside of a man." As a salesman back in Indiana, Urschel doesn't "function too good sometimes," he said. Standing in a grassy field outside Burlingame, his shoulders fold inward, his mouth doesn't portray his often humorous tone. "That's the Parkinson's for you," said Bev Staats, Urschel's companion of five years. Maybe it is this intimate knowledge of life's edges that has Urschel not pushing Josh as hard as some other riders. An hour after he finished, Urschel popped open a can of Miller Lite and pointed to another horse lying in the grass receiving a veterinarian's care. "I don't ever want to push my horse to the point he has to do that," Urschel said. He called it a "shame, a tragedy" that two horses died Tuesday when they ran past the finish line and into a road where they were hit by an oncoming car in the central Kansas county of McPherson. The two riders were airlifted to a Wichita hospital. Urschel said he always wants to win the "best condition" category, which is a combination of finish place and the horse's health. As for his condition, Urschel knows it will catch up to him, and riding will someday cease its therapeutic affects and become impossible. That day is a ways off, he says. In fact, with 105 miles to go, he may just keep on keepin' on after the race ends Sunday in Independence, Mo. Maybe he will ride on through to home in Wabash, Ind. "Nah, even then, I'll just keep riding and riding and riding," he said. "That'd be good. Never stop." James Carlson can be reached at (785) 295-1186 or james.carlson@cjonline.com.